As you may have read in my previous posts on the Ford Fusion Hybrid quest, I’m in the market for a new car. However, it is super difficult being a new graduate living on a teacher’s salary while paying other obligations. As a science teacher, I believe it imperative that we get the most out of our cars that we can, and hybrid technology will definitely be a requirement in my future car, whatever that may be. In the last post I made on that original quest before I originally abandoned that endeavor, I compared a number of cars that I thought would be good fits for me. 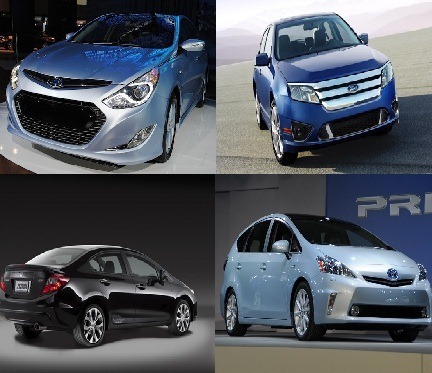 Specifically, I compared the Ford Fusion Hybrid, The Honda Civic Hybrid, and the Toyota Prius. These were all recommended via many car sites. By accident, I happened to stumble upon a car that could give all of these cars a run for their money. Specifically, I learned about the Hyundai Sonata Hybrid, which looks amazing, and despite having some initial issues, Hyundai seems to be doing a great job to make a superior vehicle. 2012 Hyundai Sonata Hybrid pricing starts at $25,850. It looks that the Ford Fusion Hybrid model year 2013 Hybrid will be unveiled next Monday, January 9th, 2012 (a day before my birthday!) I believe I will have to wait to buy a 2013 model as I won’t be able to get the money available before then and sign away my life with the loan. I would most likely be looking at comparable 2013 hybrids as well. Here’s my deal with you Hybrid car manufacturers. I will trade my expertise in writing blog posts for you in exchange for a hybrid sedan. Really, I promise. That’s directed at you Ford, Honda, Toyota, and Hyundai. Especially Hyundai- I haven’t seen any particularly interesting real owners blogs. We’ll see if these companies would like some true owner blogs.